When Sarah took her ten year old daughter Tabitha out of school and embarked on an epic road trip the only thing they knew for certain was they would head north whilst it was warm and south when it got cold, 382 days and nearly 28000 km later they landed back on British soil. 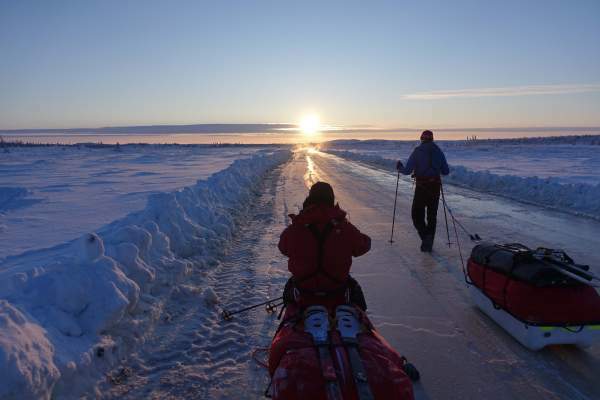 This is the tale of their epic adventure from the Arctic Circle to the Sahara desert. We took in a brief itinerary of Yangon, then journeyed on to Maymyo to see the Hill Station. Then we went to British Burma. The journey continued to Mandalay cruising along the Irrawaddy river to old Bagan. Next stop, a flight to Inle Lake to visit local villages along the canals before returning to Yangon, and ending the journey in Singapore. The Mauritania iron ore train is the true definition of a cult classic: an epic overnight train journey involving hopping on a freight wagon full of iron ore in zero comfort through a dangerous country while experiencing the amazing Sahara desert and night sky. 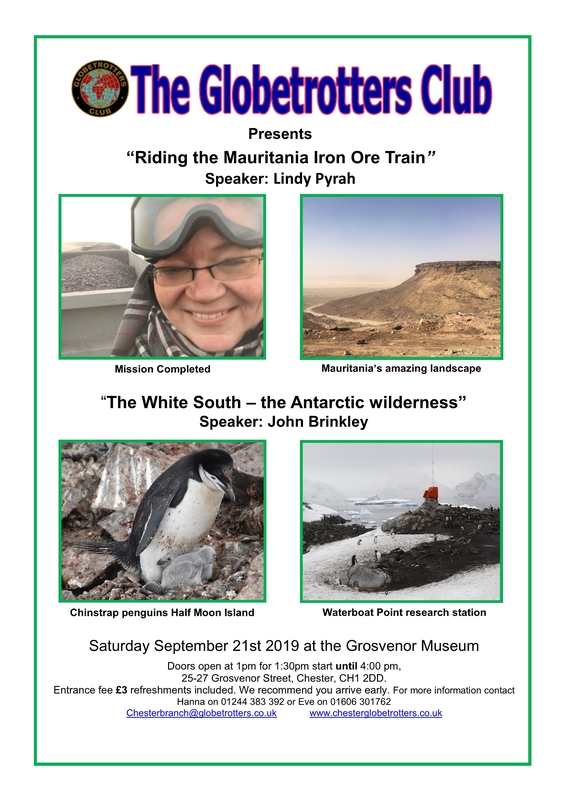 Lindy is a train journey enthusiast and a London branch Globetrotters committee member, she did the Mauritania iron ore train solo in January 2018 and would love to share her story of how she prepared, experienced and lived to tell the tale of this amazing journey. Normally desk bound for most of the year, Lindy tries to make the most of her small holiday allowance to undertake memorable adventures. A geology lecturer, both on land and on cruise ships, John will present an illustrated talk on one of the World’s last wilderness, the Antarctic. 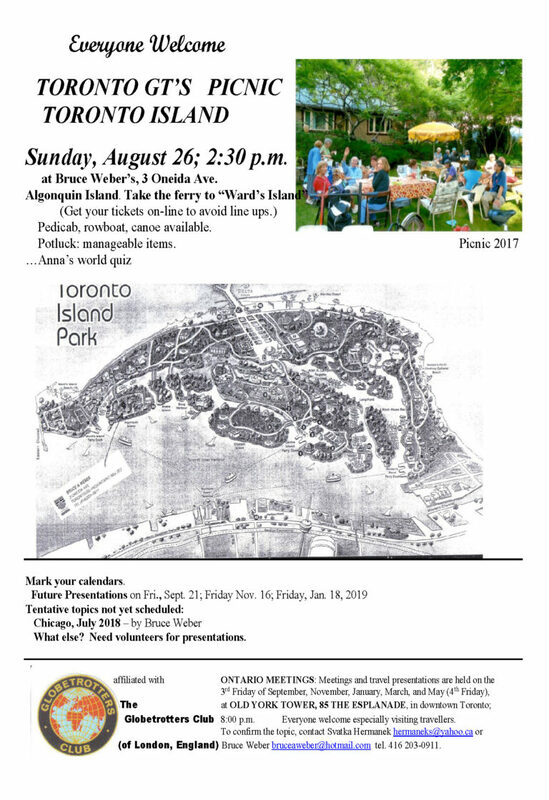 Using his own material from recent visits, John will discuss both the geological history and natural scenery of this remote region. A journey to Riga, Vilnius, Minsk, Kaliningrad and Gdansk gave an opportunity to compare the post-Soviet states which have turned westwards towards Europe with those which have stuck with Russia, and also to study the relics of the Teutonic Knights, the Hanseatic League, the Polish-Lithuanian empire and the long struggle between Germany and Russia. 1st. 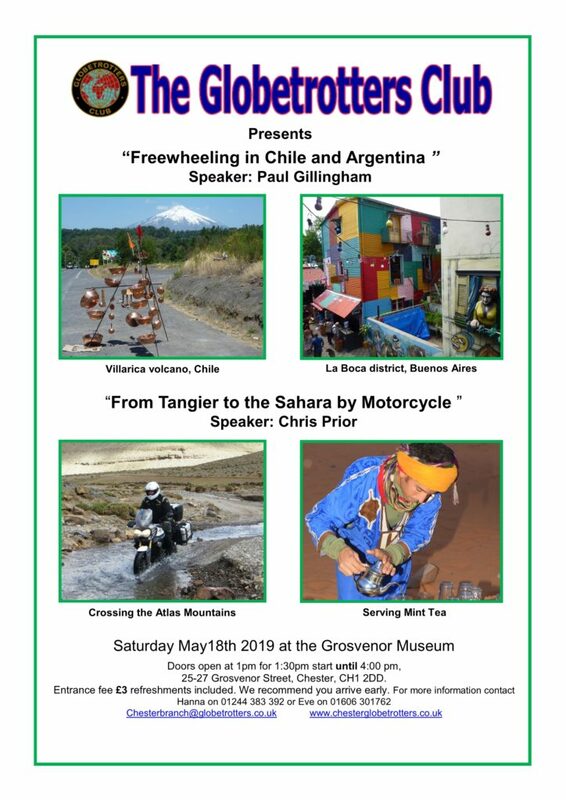 Paul Gillingham – freewheeling in Chile and Argentina. Paul visits Santiago and Valparaiso in Chile, rents city bikes to sample the Argentine grape in Mendoza and explore tango, Evita and Maradona in Buenos Aires. He joins his two sons on a cycle-camping expedition around the lakes and volcanoes of northern Patagonia. Now retired, Paul taught history in UK, Canada, Tanzania and Hong Kong before becoming a journalist and broadcaster, producing travel features from around the world. Together with 17 other motorcyclists I rode my Triumph Tiger through Spain to Morocco. From Tangiers we travelled over the Atlas Mountains to the Sahara at Merzouga. The return route included dirt roads around the Todra Gorge. After a stop at Ben Haddou we travelled to Marrakech and then headed north back to the port of Tangiers. Six days were spent in transit through Spain and eleven in Morocco. The London Branch will again be running a travel advice clinic at the show, why not come along and see us as well as catching some of the over 70 FREE Talks and Workshops. You can use the code below to get 15% of tickets before 15 January 2019. The UK’s only event dedicated to travel experiences off the beaten track returns to Olympia London from 19-20 January. With 130 specialist adventure travel companies from across the world, over 70 free inspirational talks, one-to-one seminars and a series of beautiful adventure travel films, the show is sure to whet even the most adventurous appetite. Join Levison Wood as he combines current affairs with rip-roaring adventure and behind-the-scenes moments from his 5000 mile circumnavigation of the Arabian Peninsula. 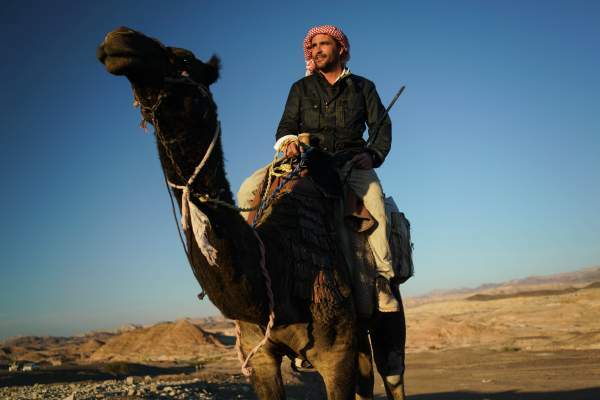 Journeying by foot, camel, mule, truck, car, and tank(! ), Lev’s talk is a must-attend for anyone with a spirit for adventure. Seats are limited. 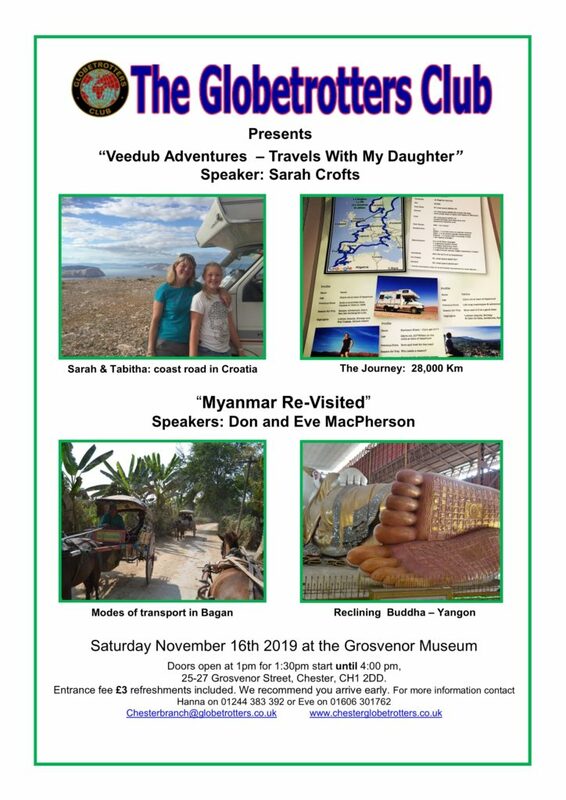 Rebecca Stephens MBE, George Bullard, Dave Cornthwaite, Richard Matheson Harpham, Chris Scott and other intrepid adventurers and travel writers will share their incredible stories, leaving you inspired, informed and raring to go on your next trip. Cicerone Guide’s experienced expedition planners will offer advice on multi-day trekking across Europe, the Himalayas and beyond as well as giving tips on touring on two wheels. Expedition planner Duncan Milligan and TV producer Antonia Bolingbroke-Kent (Joanna Lumley’s ‘Silk Road Adventure’) provide all you need to know about self-organised trips. Austin Vince and Lois Pryce give the low- down on taking your motorcycle adventures beyond home soil into Europe and beyond. Saturday night is film night. Enjoy amazing independent adventure travel films culminating with Olie Hunter-Smart’s absorbing film, ‘Road to Independence’ documenting his walk from north to south India. *Offer ends on 15 January 2019. We were offered 18 days of dog-sitting and wondered how best to use it. We love Mallorca and wanted to see where we could get to that was reasonably nearby. 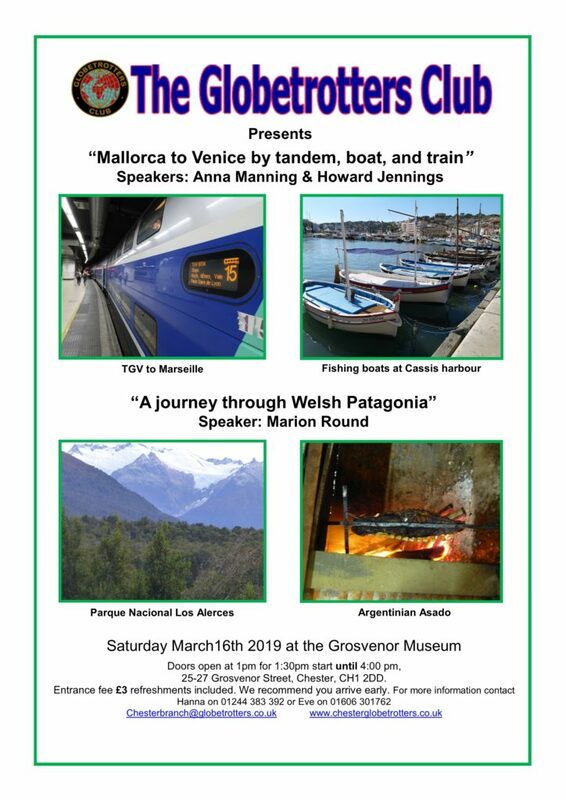 Our trip has five stops joined by tandem, boat, and train and takes us through three countries: Spain, France, and Italy. We’ll describe how we put the trip together, our adventures along the way, the food we ate, the views we saw, and the people we met. In 1865 153 Welsh people embarked on a journey to Patagonia, they were promised a fertile land with fresh water; this is not what they found. The 2 main areas where the Welsh have settled are now thriving, with the Welsh language and culture is increasing. We travelled through the Welsh areas, and across the huge Desert separating them, looking at fascinating places where few people ever get to. Marion comes from a Welsh family, and ais re-learning the language. Marion enjoys travelling to interesting places with small group tour companies. Jim Holmes is a documentary photographer that has lived and worked through Asia for over 30 years. He has worked on humanitarian and international development projects for agencies such as Oxfam and the UN. He specialised in the Mekong region countries for 20 years. The Lower Mekong flows through Laos, Cambodia, Thailand and into Vietnam, where through the mouths of the nine dragons, it empties its silt laden water into the sea. War ravaged these nations and maintained the poverty that was so evident until recent years. The river brought survival with its bounty of fish but now the flow is threatened by hydropower which could bring riches and poverty. ” Paint cannot touch it and words are wasted ” wrote Frederic Remington in 1895 whilst pony trekking through Yellowstone. At over 2.2 million acres, Yellowstone was the USA’s and the world’s first National Park when established in 1872. 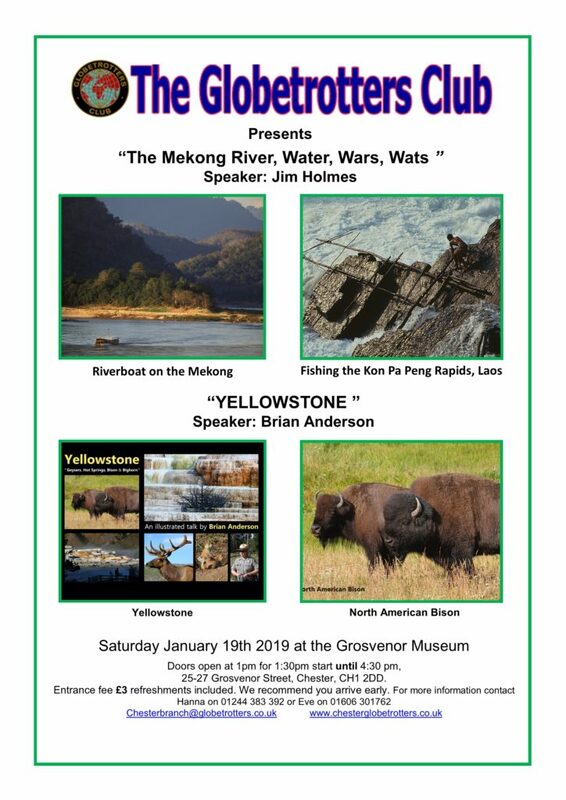 This awesome place contains some of the world’s biggest geysers and hot springs, magnificent landscapes, and mighty beasts, including bears, bison, elk and wolves. Share Brian’s stunning landscape and wildlife images from his 2013 trip to this simply staggering wilderness region. ‘Yellowstone’ is a must for all armchair nature lovers. I visited Palestine/ Israel on an Alternative Pilgrimage, staying in Bethlehem and Nazareth in October 2015. I spent the majority of my visit meeting with local people and organisations working for peace with justice. The trip was life transforming and I subsequently became a Bethlehem Ambassador. The slides will show Bethlehem, Jerusalem, Hebron, Nazareth, Jericho, Haifa & the Galilee area. The talk will include information about the opportunities and the welcome visitors will receive in Palestine. 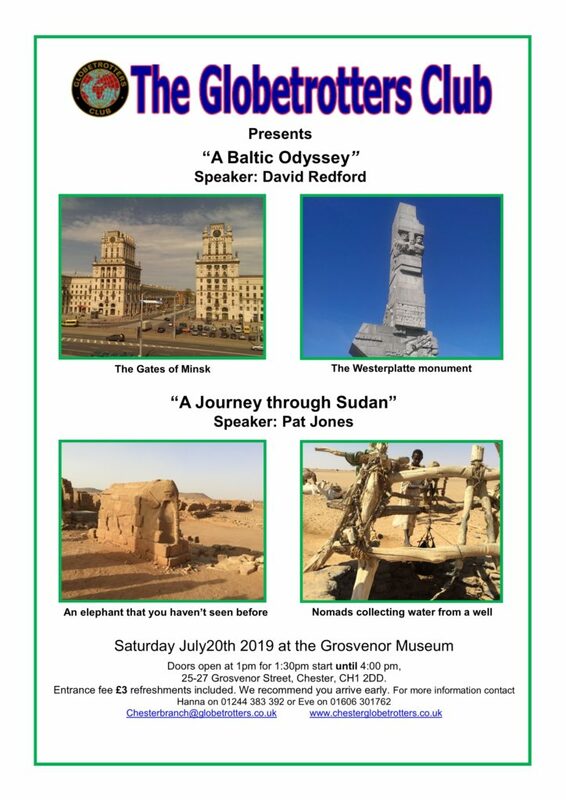 I will also provide information about places to stay and organisations that can provide an authentic experience of the rich Palestinian culture which survives despite living under military occupation. 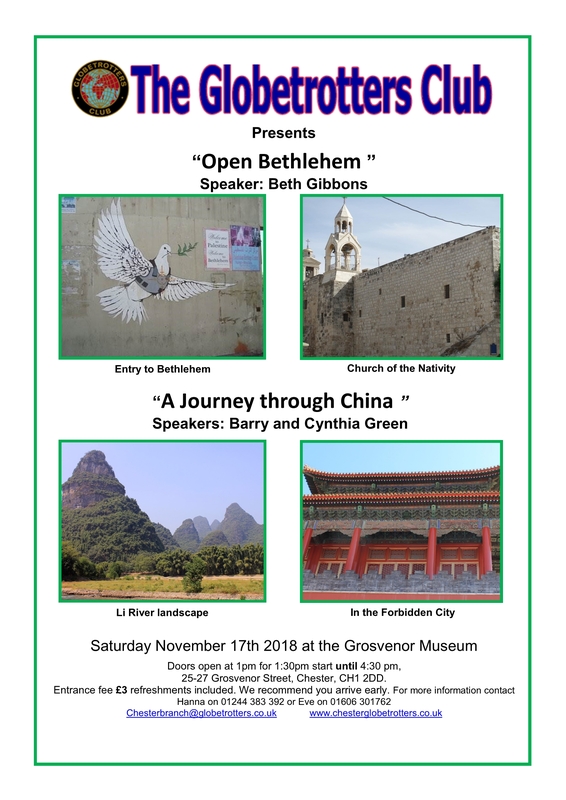 Barry and Cynthia Green – ‘A Journey through China’. Images from a tour of China visiting historic sites, iconic landscapes and modern cities giving a flavour of life in China through the ages. Barry is a retired engineer and Cynthia, a retired librarian who both volunteer at the National Waterways Museum, Ellesmere Port as well as travelling to interesting places.